Name: Jerome Guerrini Arrested for: Murder Arrested at: North Shields Police Station Arrested on: 22 July 1904 Tyne and Wear Archives ref: DX1388-1-53-Jerome Guerrini The Morpeth Herald for 26 November 1904 reported that: "At the Assizes on Saturday, before Mr Justice Darling, Jerome Guerrini, alias Joseph Brunetti (27), fireman and a French subject, was charged with the wilful murder of Patrick Gillighan on July 4th in the Borough of Tynemouth ... Mr Hans Hamilton, in opening the case for the prosecution, said prisoner for the last four years has been a seafaring man. He was a Frenchman by birth, having been born in Corsica, although his name appeared more like an Italian one. Patrick Gillighan was a labourer and resided in Clive Street, North Shields. It appeared that on July 2nd prisoner came with a ship into the Tyne and took up his lodgings at 82 Clive Street. The deceased man lived almost directly opposite, with two brothers of the name of Davis. About 11 o'clock of the night of July 4th a noise was heard at the back of No. 10 Clive Street. One of the brothers Davis went out and saw the deceased, the prisoner and a friend of the latter named Petro Arteche. He heard the deceased man tell the prisoner and his companion to shift, as it was no place for them to commit a nuisance. Davis would tell then that he saw the prisoner strike the deceased in the chest. Davis told the deceased to come into the house which he did. Gillighan sat down to supper and just at that moment a noise was heard at the shop door in the front street. Wm Davis opened the door, but saw no one. The deceased also appeared to have come to the door, spoken to someone in the street, and proceeded immediately down an adjoining passage. While he was going down a noise was heard at the back door. Davis followed him down the passage and saw him with head of prisoner's friend, Arteche under his right arm, and was striking him. The deceased also struck at the prisoner on the right side of the head, causing it to bleed. Then it appeared that the prisoner retired a few yards, rushed at the deceased and struck him on the left side. Davis saw no knife but a few seconds afterwards he was attacked by prisoner. Davis avoided a blow and when the prisoner raised his hand he saw he had a knife. Deceased staggered forward and fell. Davis went to help him up the passage and while he was going Gillighan said 'Willie, I am stabbed'." Gillighan died shortly afterwards of internal bleeding. During the trial Guerrini's solicitor, Mr Mitchell-Innes asked the jury to find a verdict of manslaughter, emphasising that he was not the aggressor and only used his knife in the heat of the moment. He pointed to Gillinghan's conviction four years earlier for a serious assault on another man with a bottle and a knife. Caroline Evans, a married woman living in Clive Street, also testified that she saw Gillighan "seize the prisoner and drag him across the back lane". She heard the prisoner say "I am not making a noise, I don't want to fight". The Morpeth Herald reports that "Judge Darling, in his summing up, said that if there was anything that distinguished a Corsican from the native of any other country, it was the hotness of his blood and the constant use of the knife. He thought the jury should observe this fact in the case. The jury found prisoner guilty of manslaughter and he was sentenced to fifteen years penal servitude". These images are a selection from an album of photographs of prisoners brought before the North Shields Police Court between 1902 and 1916 in the collection of Tyne & Wear Archives (TWA ref DX1388/1). (Copyright) We're happy for you to share this digital image within the spirit of The Commons. Please cite 'Tyne & Wear Archives & Museums' when reusing. Certain restrictions on high quality reproductions and commercial use of the original physical version apply though; if you're unsure please email archives@twmuseums.org.uk. Name: Rose Sparrow alias Burns Arrested for: not given Arrested at: North Shields Police Station Arrested on: 5 March 1906 Tyne and Wear Archives ref: DX1388-1-39-Rose Sparrow AKA Burns For an image of her accomplice (and mother), Ellen Leavy, see www.flickr.com/photos/twm_news/22669115693/in/dateposted/. The Shields Daily News for 12 March 1906 reports: ?SHOP-DOOR ROBBERIES AT NORTH SHIELDS. MOTHER AND DAUGHTER SENT TO PRISON. At North Shields Police Court today Ellen Leavey (46), 8 Barrington Lane and Rose Sparrow (26), Park Street, South Shields, mother and daughter, were charged on remand with having, on the 3rd March, stolen from the shop door of No. 96 Bedford Street, a child?s dress, valued at 6s 11d, or with receiving the same, well knowing it to have been stolen. An assistant with the prosecutrix (Miss M.A. Hogg), a draper, said she missed the dress and gave information to the police. Inspector Thornton said that he arrested the prisoner Sparrow in Barrington Street, South Shields and charged her with the theft and she replied that she was so drunk that she knew nothing about it. PC Graham said he arrested Leavey in the back lane of Sibthorpe Street, she then having the dress in her possession. He charged her and she made no reply. They were further charged on the same date with having stolen seven blouses valued at 13s 8d from the shop door of Mr Thos. Heslop, draper, Saville Street. Prosecutor said that at 3.20 pm, from what he was told, he followed the prisoners down Rudyard Street back lane and found the seven blouses and two pairs of boots under the shawl of the younger prisoner. The elder woman had also two pairs of boots. He detained Leavey until the arrival of the police, but Sparrow bolted. Bridget Leavey, a child of 10 and a daughter and sister of the prisoners, who was with them, said she saw Rosie steal the articles and give them to her mother to run way with. Prisoners were also charged with having stolen four pairs of boots, valued at 16s 10d, from the shop door of Messrs Stead and Simpson, 2 Saville Stret, on the 3rd inst. and further with having stolen a shawl, valued at 3s, from the shop door of Margaret Armstrong on the 3rd inst. Similar evidence was given and upon being formally charged Leavey pleaded not guilty and Sparrow admitted the thefts and said her mother had nothing to do with them. She asked to be leniently dealt with. She had taken to drink in consequence of her husband having neglected her and if she was given one more chance she would keep off the drink and never enter the town again. The magistrate committed them to prison for 7 days in each case, one month in all. The Chairman (Ald Collins), after giving the decision, said the tradesmen were very much to blame for hanging goods outside the door. If they insisted on hanging goods outside, they must have someone to watch them. The Chief Constable said they were indebted to Mr Heslop for the arrest of the prisoners?. Sadly Rose Sparrow couldn?t live up to her promises to change her ways. Less than two months later the Shields Daily News for 30 April 1906 reported: ?SHOP DOOR THEFT AT NORTH SHIELDS. At North Shields Police Court today, Rose Sparrow (26), married, No. 5 Cross Street, was charged with having stolen two pairs of slippers, valued at 7s 6d, the property of Julius Jacobs, general dealer, Duke Street, on Saturday evening. The prosecutor?s son said the slippers were hanging outside the shop door and from what he was told he followed the accused towards the Bull Ring. He asked her for the slippers she had stolen and while he was speaking to her the slippers produced dropped upon the street as did also a pair of new boots. The accused was further charged with stealing a pair of boots valued at 6s 6d, the property of Shiklman Michael, Duke Street, on Saturday last. Chief Constable Huish said that in March last the accused was convicted on four charges of shoplifting and since then she had been fourteen days in Durham Gaol. She was committed to prison for fourteen days on each charge. Lieut. Col. Haswell, one of the magistrates, said the hanging of goods outside shop doors led to a good deal of evil doing.? These images are a selection from an album of photographs of prisoners brought before the North Shields Police Court between 1902 and 1916 in the collection of Tyne & Wear Archives (TWA ref DX1388/1). (Copyright) We're happy for you to share this digital image within the spirit of The Commons. Please cite 'Tyne & Wear Archives & Museums' when reusing. Certain restrictions on high quality reproductions and commercial use of the original physical version apply though; if you're unsure please email archives@twmuseums.org.uk. Does prison work? Does prison work? Name: Ellen Leavy alias Burns Arrested for: not given Arrested at: North Shields Police Station Arrested on: 5 March 1906 Tyne and Wear Archives ref: DX1388-1-39-Ellen Leavy AKA Burns For an image of her accomplice (and daughter), Rose Sparrow, see www.flickr.com/photos/twm_news/16888885997/in/album-72157.... The Shields Daily News for 12 March 1906 reports: ?SHOP-DOOR ROBBERIES AT NORTH SHIELDS. MOTHER AND DAUGHTER SENT TO PRISON. At North Shields Police Court today Ellen Leavey (46), 8 Barrington Lane and Rose Sparrow (26), Park Street, South Shields, mother and daughter, were charged on remand with having, on the 3rd March, stolen from the shop door of No. 96 Bedford Street, a child?s dress, valued at 6s 11d, or with receiving the same, well knowing it to have been stolen. An assistant with the prosecutrix (Miss M.A. Hogg), a draper, said she missed the dress and gave information to the police. Inspector Thornton said that he arrested the prisoner Sparrow in Barrington Street, South Shields and charged her with the theft and she replied that she was so drunk that she knew nothing about it. PC Graham said he arrested Leavey in the back lane of Sibthorpe Street, she then having the dress in her possession. He charged her and she made no reply. They were further charged on the same date with having stolen seven blouses valued at 13s 8d from the shop door of Mr Thos. Heslop, draper, Saville Street. Prosecutor said that at 3.20 pm, from what he was told, he followed the prisoners down Rudyard Street back lane and found the seven blouses and two pairs of boots under the shawl of the younger prisoner. The elder woman had also two pairs of boots. He detained Leavey until the arrival of the police, but Sparrow bolted. Bridget Leavey, a child of 10 and a daughter and sister of the prisoners, who was with them, said she saw Rosie steal the articles and give them to her mother to run way with. Prisoners were also charged with having stolen four pairs of boots, valued at 16s 10d, from the shop door of Messrs Stead and Simpson, 2 Saville Stret, on the 3rd inst. and further with having stolen a shawl, valued at 3s, from the shop door of Margaret Armstrong on the 3rd inst. Similar evidence was given and upon being formally charged Leavey pleaded not guilty and Sparrow admitted the thefts and said her mother had nothing to do with them. She asked to be leniently dealt with. She had taken to drink in consequence of her husband having neglected her and if she was given one more chance she would keep off the drink and never enter the town again. The magistrate committed them to prison for 7 days in each case, one month in all. The Chairman (Ald Collins), after giving the decision, said the tradesmen were very much to blame for hanging goods outside the door. If they insisted on hanging goods outside, they must have someone to watch them. The Chief Constable said they were indebted to Mr Heslop for the arrest of the prisoners?. These images are a selection from an album of photographs of prisoners brought before the North Shields Police Court between 1902 and 1916 in the collection of Tyne & Wear Archives (TWA ref DX1388/1). (Copyright) We're happy for you to share this digital image within the spirit of The Commons. Please cite 'Tyne & Wear Archives & Museums' when reusing. Certain restrictions on high quality reproductions and commercial use of the original physical version apply though; if you're unsure please email archives@twmuseums.org.uk. Name: James Lee Arrested for: not given Arrested at: North Shields Police Station Arrested on: 1 May 1905 Tyne and Wear Archives ref: DX1388-1-69-James Lee The Shields Daily News for 8 May 1905 reports: ?FALSE PRETENCES AT NORTH SHIELDS. At North Shields Police Court today, James Lee, alias John Lee (42), fitter, Manchester, was charged with having obtained, by means of false pretences, food of the value of 2s and 5s in money from Isabella Bowmaker on the 8th ult. Prosecutrix who resides at Coulson?s Bank, Clive Street, said that the accused came to her house and asked to be taken in as a lodger. They came to terms, the prisoner promising to pay 14s per week. He said he was busy altering a weighing machine on the Penny Ferry landing and would be engaged at least a week. He stayed until the following day and after he had had his dinner he borrowed 5s from her, saying he had to get some ironwork at the North Shields Railway Station. He went out and did not return. Afterwards she made enquiries and ascertained that his representations were false. Alex. Roberts, bridgeman at the ferry landing, said there were no weighing machines on the landing. Inspector Thornton gave evidence as to arresting and charging the prisoner, who admitted his guilt. There was a second charge against him of having obtained, by means of false pretences, 2s from Robert Atkinson, on the 4th ult. Prosecutor said the accused came to him and told him that the firm with which he was employed in Sheffield had failed to send him certain tools and he wished to wire them and his wife. He pulled some money out of his pocket, accused having asked for the loan of 1s 6d, and when he saw a two shilling piece, he remarked: ?Make it 2s?. He did so and never saw him again. Chief Constable Huish put in a record of convictions against the prisoner, who had suffered imprisonment for fraud in various parts of the country. Accused said he intended to refund the money after he had obtained employment. The magistrates committed him to prison for 3 months in each case?. These images are a selection from an album of photographs of prisoners brought before the North Shields Police Court between 1902 and 1916 in the collection of Tyne & Wear Archives (TWA ref DX1388/1). (Copyright) We're happy for you to share this digital image within the spirit of The Commons. Please cite 'Tyne & Wear Archives & Museums' when reusing. Certain restrictions on high quality reproductions and commercial use of the original physical version apply though; if you're unsure please email archives@twmuseums.org.uk. Name: William Morrissey alias Smith Arrested for: Sleeping Out Arrested at: North Shields Police Station Arrested on: 11 July 1904 Tyne and Wear Archives ref: DX1388-1-53-William Morrisey AKA Smith The Shields Daily Gazette for 11 July 1904 reported: "At North Shields, Charles Winlow (53), tramp, no fixed abode, was charge with lodging in a hay stack in Mariners' Lane without having visible means of subsistence, and was sent to prison for seven days. William Wadham, Tyne Dock, William Smith or Morrison, shoeblack, and William Patton, no fixed abode, were charged with lodging in a hay pike at Kenners Dene Farm. Wadham and Smith were each committed for seven days and Patton was committed for 14 days". For a mugshot of William Wadham see www.flickr.com/photos/twm_news/15870103783/in/set-7215762.... The Shields Daily Gazette for 7 June 1904 reports: "Two youths named Joseph Leach, 52 Wilson Street, and William Morrisey, no fixed abode, were found by PC Twiddy were found sleeping in a railway carriage on the N.E.R. siding in Garden Lane, at 3.15 this morning. Relating the facts to the South Shields magistrates the officer said that when he roused Leach that defendant set himself in a fighting attitude, while the other sat up on the seat, lit a cigarette and refused to leave ... The magistrates fined them 5s and costs each". Contemporary attitudes to rough sleeping can be seen in a report in the Shields Daily Gazette on 5 October 1903. "At Jarrow today John Smith, Wm Cooper, James Bell, young men who said they came to the town in search of work, were charged with sleeping in Palmers Works last night. PC Lowery gave evidence and Supt Fleming said that the county was 'swarming' with fellows like defendants, who should be made to seek shelter in the Workhouses. Defendants were sent to prison for 7 days". The Shields Daily Gazette of 8 October 1903 contains an article entitled 'Lazy Loafers': "There are some people who will neither work nor want. They are the typical loafers we can see in the streets any day. Apparently we have a fairly good stock of them at North Shields. It is not because of depression of trade either. The other morning no fewer than half a dozen of such individuals were place in the dock on a charge of sleeping out. The officer had found them all huddled together in an empty room during the night and they could not give a satisfactory account of themselves. When questioned by the magistrates, the police officers stated that all the defendants were lazy loafers, who had never worked for a considerable time. They did nothing but lounge about the streets during the day and then obtained shelter in some empty room or outhouse at night. The magistrates marked their sense of the offence by sending them all to prison for a month each - each with hard labour. A month of hard work will probably do them a vast of good and will enable them to shake off that habitual tired feeling". Morrisey was convicted on numerous other occasions. The Shields Daily Gazette of 5 November 1902 reported: "At South Shields today a youth named William Morrisey was charged with stealing on the 4th inst. a jacket of the value of 2s 3d, the property of James Davison". He was fined 10s and costs. The Shields Daily Gazette for 2 January 1903 reported: "Before the Mayor (Counc. James Grant) and other magistrates at So. Shields, on Wednesday, William Morrisey, 16, and Arthur Cairns, 18, were charged with stealing on Dec. 29th, a barometer, valued at 25s ... on the way to the Police Station Morrisey remarked "A couple of months would just about put me right" ... The Bench fined Morrisey, who had previously convicted for larceny, 10s and costs, and Cairns 5s and costs". The Shields Daily News for 10 July 1905 reported: "At South Shields Police Court today William Morrisey (20). no fixed abode and David McNess (19), Anderson's Lane, were charged with breaking and entering the dwelling house of Mary McCalvery on the 8th inst. and stealing therein two desks value 10s. Prosecutrix said she kept a green grocer's shop in Tyne Street and resided upon the premises. At half-past twelve on the afternoon of the 8th inst she locked up her house and shop, leaving two desks, which contained some valuables, on a desk bed in the kitchen. When she returned to her house at twenty past ten at night she found that someone had been in the house and that the desks had been removed from the desk bed on to the floor near the door. A witness deposed to seeing the prisoners loitering near the prosecutrix's shop. She afterwards saw Morrisey open the house door with a key and go in. She then informed the police. PC Ogg said from what he was told he visited the prosecutrix's house and on going inside he found Morrisey in the kitchen. He took him into custody. He afterwards apprehended McNess. The prisoner had nothing to say. This was Morrisey's 18th offence and he was committed to prison for 3 months; this being McNess's 1st offence, he was bound over for three months". These images are a selection from an album of photographs of prisoners brought before the North Shields Police Court between 1902 and 1916 in the collection of Tyne & Wear Archives (TWA ref DX1388/1). This set contains mugshots of boys and girls under the age of 21. This reflects the fact that until 1970 that was the legal age of majority in the UK. (Copyright) We're happy for you to share this digital image within the spirit of The Commons. Please cite 'Tyne & Wear Archives & Museums' when reusing. Certain restrictions on high quality reproductions and commercial use of the original physical version apply though; if you're unsure please email archives@twmuseums.org.uk. 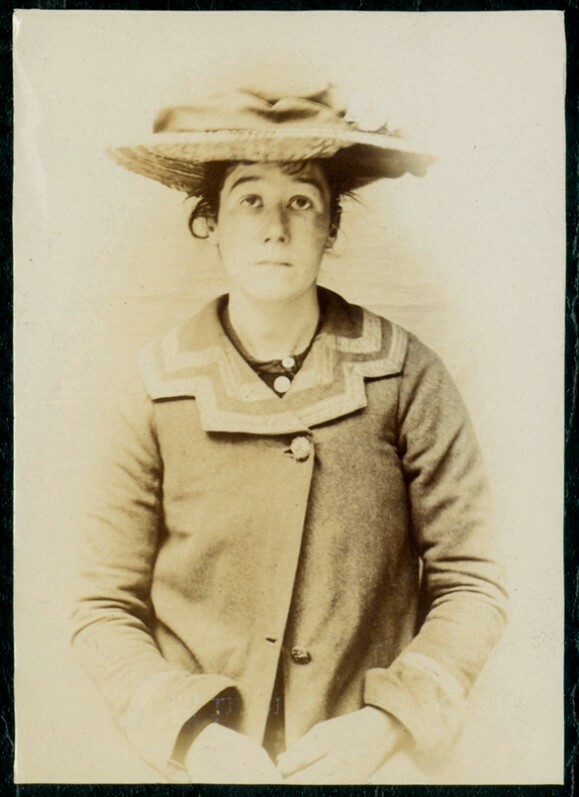 Name: Mary Johnson Arrested for: Larceny Arrested at: North Shields Police Station Arrested on: 8 August 1904 Tyne and Wear Archives ref: DX1388-1-35-Mary Johnson The Shields Daily Gazette for 8 August 1904 reports: "THREE MONTHS EACH. NEWCASTLE THIEVES IN NORTH SHIELDS Daniel McCann (30), Newcastle, and Mary Johnson (30), alias Elizabeth Chantiller, Newcastle, were charged with stealing the sum of 7s 2d from George Henry Lilley on the 6th. The prosecutor stated that at 8.35 pm on Saturday he was going along Collingwood Street when he saw the prisoners, who asked him to stand them a drink. They went into a public-house snug and witness called for three drinks. They were supplied, and immediately afterwards the male prisoner put his arms round his (witnesses's) neck. The two prisoners then went out and he followed them, and on putting his hand in his pocket he missed his money and some tobacco. He went to the prisoners and told them he had lost his money. They replied "We have not got it". He informed the police of his loss, and the two prisoners were afterwards arrested. Sergt. Weatherburn spoke to arresting the prisoners forty minutes after prosecutor spoke to him. In the male's possession was found 5s 2d and some tobacco which the prosecutor afterwards identified as his property. Prisoners now pleaded guilty. Chief Constable Huish said the man began his career in 1893 and the woman in 1895. This was the man's 36th appearance. In June 1893 , he was convicted for larceny from the person in Carlisle. The woman had also been convicted for frequenting for the purpose of committing a felony. The magistrates committed them for three months each". For a view of Mary Johnson's accomplice see www.flickr.com/photos/twm_news/17714583014/in/photostream/. These images are a selection from an album of photographs of prisoners brought before the North Shields Police Court between 1902 and 1916 in the collection of Tyne & Wear Archives (TWA ref DX1388/1). Copyright) We're happy for you to share this digital image within the spirit of The Commons. Please cite 'Tyne & Wear Archives & Museums' when reusing. Certain restrictions on high quality reproductions and commercial use of the original physical version apply though; if you're unsure please email archives@twmuseums.org.uk. Name: Frederick Mudd Arrested for: Larceny Arrested at: North Shields Police Station Arrested on: 3 April 1905 Tyne and Wear Archives ref: DX1388-1-69-Frederick Mudd The Shields Daily News for 11 February 1905 reports: ?ANOTHER FISH STEALER SENT TO PRISON At the North Shields Police Court this morning ? 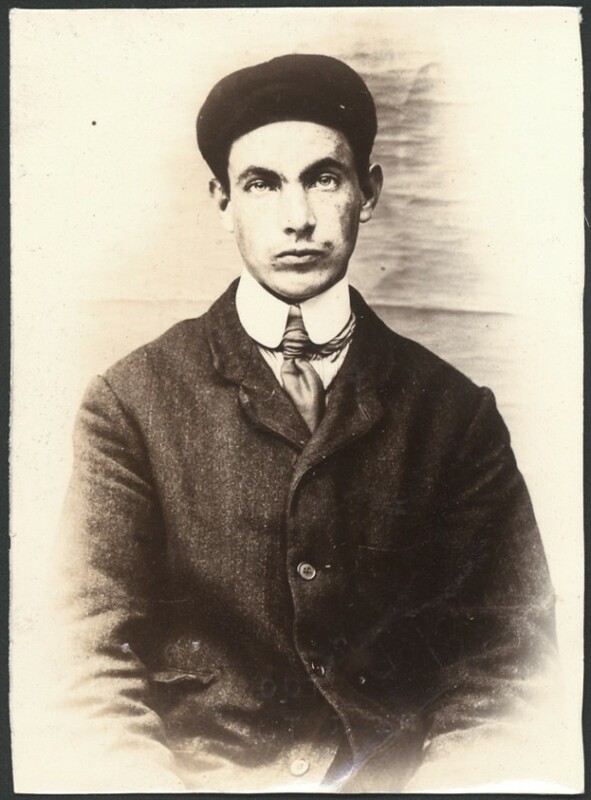 Frederick Mudd, 17 years of age, residing at 13 Reed Street, was charged with stealing a quantity of haddocks, valued at 3s, the property of the Tyne Steam Fishing Coy, on the 10th inst. PC Spindler said that on Friday afternoon he met the accused coming from the direction of the steam trawler Tyne Belle, carrying a quantity of haddocks. A soon as the accused saw him he dropped the haddocks and ran away. Afterwards he arrested the accused and charged him with stealing the fish, to which he replied, ?I have nothing to say?. A clerk representing the Tyne Steam Fishing Company estimated the value of the fish, which the accused dropped at 3s. The Bench committed prisoner to gaol for fourteen days with hard labour?. The Shields Daily News for 3 April 1905 reports: ?LARCENY FROM A NORTH SHIELDS TRAWLER. A BOY ROBS HIS BENEFACTORS. At North Shields Police Court today, Frederick Mudd (17), no fixed abode, was charged with stealing 4s, the moneys of Frederick Marriott, mate of the steam trawler Volunteer, on the 30th ult. The Prosecutor stated that before the boat cast off on March 27th the accused came on board, and in consequence of the statements he made, he was taken to sea. When the boat returned on the 30th ult. the prisoner went ashore and witness missed 4s from his coat pocket in the cabin. PC Spindler said he arrested the accused at noon on the same date. He said he was very sorry he had taken the money. Witness found 3s in his possession and got 3d at a cook shop where the prisoner had left it. In answer to the magistrates clerk (Mr R.F. Kidd) the prosecutor said that the reason the accused was taken to sea was that he stated he had no father and no mother, and accordingly they took pity on him. Prisoner pleaded guilty to this charge, and also to a further charge of stealing 2s 2d belonging to the third hand of the same steamer. Ald. Elliot said that it was very bad and very ungrateful behaviour on the part of the accused towards those who had shown him kindness by giving him food and shelter. He would be committed to prison for six weeks with hard labour?. The Shields Daily News for 12 September 1905 reports: ?THREE MONTHS FOR THEFT At North Shields Police Court today, Frederick Mudd (17), Myock?s lodging house, was charged with having stolen a pair of Wellington boots, valued at 3s the property of Edgar Beal, a youth employed on board the steam drifter Seymolicus, of Yarmouth. The prosecutor deposed on the 10th inst. he missed the boots from the fo?c?stle, where he had put them two days previously. PC Spindler said he saw the prisoner on the Fish Quay yesterday morning, wearing the boots. He charged him with having stolen them, and he replied that he bought them from a man for 6d, but on the way to the police station he said he might as well speak the truth, and admitted that he stole the boots on Friday. Chief Constable Huish said the accused, who made his 7th appearance, had been previously imprisoned for theft. He was committed for three months with hard labour?. These images are a selection from an album of photographs of prisoners brought before the North Shields Police Court between 1902 and 1916 in the collection of Tyne & Wear Archives (TWA ref DX1388/1). This set contains mugshots of boys and girls under the age of 21. This reflects the fact that until 1970 that was the legal age of majority in the UK. (Copyright) We're happy for you to share this digital image within the spirit of The Commons. Please cite 'Tyne & Wear Archives & Museums' when reusing. Certain restrictions on high quality reproductions and commercial use of the original physical version apply though; if you're unsure please email archives@twmuseums.org.uk. Name: James McClarence alias Henry Noble Arrested for: not given Arrested at: North Shields Police Station Arrested on: 24 September 1906 Tyne and Wear Archives ref: DX1388-1-95-James McClarence AKA Henry Noble The Shields Daily News for 1 October 1906 reports: ?LARCENY AT NORTH SHIELDS. ACCUSED COMMITTED FOR TRIAL At North Shields Police Court today John McClarance or Noble (24), belonging to Sunderland, was charged with having stolen a jacket and vest, and two silk handkerchiefs, valued at 15s, the property of the executors of the late J. M. Fisher, pawnbroker carrying on business in Saville Street. Joseph Fisher, an assistant with the prosecutors, stated that at 10.45 a.m., from what he was told, he missed the articles from the rail above the shop door. He saw the prisoner, accompanied by two other men, walking up the street, the prisoner carrying the missing goods. He followed them into Wellington Street, and the accused ran into a back lane and threw the bundle into Wood?s bakehouse. James Wilson Veitch, another assistant, who joined the chase of the three men, said that he followed them through the streets until they reached Coach Lane. There he met Inspector Proud, and after he had caught the prisoner he handed him over to the custody of the inspector. Evidence of the arrest was given by Inspector Proud, who stated that when he charged the accused he replied, ?I only picked them up from the flags.? Formally charged by the Magistrate?s Clerk, he said, ?That?s right.? Chief Constable Huish stated that the accused made his 14th appearance. He had served 12 months, and had been convicted of theft twice this year, receiving three months on each occasion. The magistrates committed him for trial.? The Shields Daily News for 18 October 1906 reports from the Northumberland Sessions: ?THEFT AT TYNEMOUTH John McClarance (24), labourer, was sentenced to six months? imprisonment for having stolen clothing at Tynemouth, on Sept 22. Prisoner had pleaded guilty.? These images are a selection from an album of photographs of prisoners brought before the North Shields Police Court between 1902 and 1916 in the collection of Tyne & Wear Archives (TWA ref DX1388/1). (Copyright) We're happy for you to share this digital image within the spirit of The Commons. Please cite 'Tyne & Wear Archives & Museums' when reusing. Certain restrictions on high quality reproductions and commercial use of the original physical version apply though; if you're unsure please email archives@twmuseums.org.uk. Name: James Waters alias Joseph Turnbull Arrested for: not given Arrested at: North Shields Police Station Arrested on: 25 September 1906 Tyne and Wear Archives ref: DX1388-1-95-James Waters AKA Joseph Turnbull The Shields Daily News for 25 September 1906 reports: ?HOUSEBREAKING AT NORTH SHIELDS. ACCUSED COMMITTED FOR TRIAL. At North Shields Police Court today, James Turnbull, alias Waters, a young man, was charged with breaking and entering the dwelling-house, no. 2 Camp Terrace, and stealing a silver serviette ring, a lady?s silver watch, a silver spoon, a ring, bracelet, and locket, the property of Eliz. Jackson. Richard Appleby-Jackson, an articled clerk and estate agent residing at no. 2 Camp Terrace, said that on the 29th Aug. last he and the other members of the family left home and returned on the 12th Sept, finding that it had been broken into, and that a number of articles valued at �4 8s had been stolen. On the 20th inst., from what he was told, he went to the police station and there identified a serviette ring, a watch, a spoon, and other articles as the property of his mother. Anna Ramsey, residing in Howard Street, said that while the prosecutrix was from home she kept the keys of the house. On the 4th Sept she went there for the purpose of watering the plants and found everything in order. She locked the house up before she left, everything then being secure. She returned three days later and found the house in a state of disorder. Mary Isabel Davies, a cook in the employ of the prosecutrix, said that while her mistress was away she went to live in Bedford Street. On the 6th Sept she obtained the keys from the last witness in order to do some cleaning. She went next day, and was unable to open the front door because the chain on the inside had been put on, and she was obliged to get assistance in order to force an entrance. When she went into the house everything was in a state of disorder and she immediately informed the police. Michael D. Hart, dealer in second-hand goods, 120 Pilgrim Street, Newcastle, stated that on the 7th inst. the prisoner came to his shop and offered to sell the locket, bracelet and ring produced, which he said belonged to his wife, and upon which he wished to raise some money, that he was out of employment. Witness gave 5s for them. Accused also offered to sell a silver serviette ring, a spoon, and a brooch, which witness declined to buy. A watchmaker and jeweller, belonging to West Hartlepool, said that on Sept 8th the prisoner came to his shop and offered the serviette ring, photo frame and spoon for sale, saying he was ?hard up?. Witness bought the articles for 4s. Later in the day he returned with a lady?s silver watch and offered to dispose of it for 10s. It was, however, defective and he accordingly declined to buy it. Detective Radcliffe deposed to visiting the house in Camp Terrace on the 7th inst and finding the house in a state of disorder. The door leading from the front to the back of the house was fastened and he had to climb through the serving aperture in order to get to the kitchen. Detective Inspector Thornton said that on the 14th inst. he went to West Hartlepool Police Station, where the serviette ring, spoon, photo frame, and watch were handed to him in the presence of the accused, who said they were the things he got from a house in North Shields. Witness told him there was a ring, a locket and bracelet missing from the same house. Prisoner replied that he sold them to a second-hand dealer in Pilgrim Street, Newcastle. On being charged this morning the prisoner made no reply. Formally charged by the Clerk (Col. R. F. Kidd), prisoner had still nothing to say. He was committed for trial at the Quarter Sessions.? At the Northumberland Quarter Sessions The Shields Daily News for 19th October 1906 reports: ?PENAL SERVITUDE FOR HOUSEBREAKING AT TYNEMOUTH James Turnbull, 26, pleaded guilty to having broken into the dwelling-house of Elizabeth Jackson at Tynemouth and stolen several articles to the value of �4 8s. He was sentenced to five years penal servitude, the sentence to run concurrently with a term he is at present serving at Durham.? These images are a selection from an album of photographs of prisoners brought before the North Shields Police Court between 1902 and 1916 in the collection of Tyne & Wear Archives (TWA ref DX1388/1). (Copyright) We're happy for you to share this digital image within the spirit of The Commons. Please cite 'Tyne & Wear Archives & Museums' when reusing. Certain restrictions on high quality reproductions and commercial use of the original physical version apply though; if you're unsure please email archives@twmuseums.org.uk. Name: Robert Jack Arrested for: False Pretences Arrested at: North Shields Police Station Arrested on: 12 January 1905 Tyne and Wear Archives ref: DX1388-1-63-Robert Jack The Shields Daily News for 12 January 1905 reports: "At the North Shields Police Court today, Robert Jacks, ships' steward, belonging to Greenock, was charged with obtaining 10s by false pretences, from Charles Swain, tailor and clothier, Bedford Street. The prosecutor said that at a quarter to 12 on the 6th inst., the prisoner came to his shop and was measured for a suit of clothes. He stated that he was going to Glasgow to get married, and also said that he was going to be paid off from the steamer Brighton on the following morning. Before leaving the shop he obtained a loan of 10s, promising to call next day to have the coat and waistcoat tried on and to repay the loan. On Monday morning , the 9th inst., witness made inquiries at the shipping office regarding the steamer Brighton and found that it had been paid off on the 31st ult. In answer to the magistrates witness said that he had known the prisoner since last summer, having met him on the Midnight Sun, with which vessel he had some business dealings. Supt. Robt. Walton of the Board of Trade, stated that the Brighton was paid off on the 31st ult. and that the prisoner then received all the money that was due to him. Detective Sergt. Scougal said he arrested the prisoner on a warrant on board the steamer Pocklington at Tyne Dock on the 11th inst. and charged him. The accused replied "I had no intention of defrauding. If he had waited until the weekend, I would have paid". The accused stated that after ordering the suit he asked Mr Swain for the loan of a few shillings, and he lent him ten. One of the officers of the Brighton had �4 belonging to him and he intended to get that money on the following day and repay Mr Swain. He was unable to obtain it, however. The Mayor warned the prisoner to be very careful in his statement in future and fined him 10s and costs or fourteen days". These images are a selection from an album of photographs of prisoners brought before the North Shields Police Court between 1902 and 1916 in the collection of Tyne & Wear Archives (TWA ref DX1388/1). Copyright) We're happy for you to share this digital image within the spirit of The Commons. Please cite 'Tyne & Wear Archives & Museums' when reusing. Certain restrictions on high quality reproductions and commercial use of the original physical version apply though; if you're unsure please email archives@twmuseums.org.uk. Name: James E Howe Arrested for: not given Arrested at: North Shields Police Station Arrested on: 19 September 1906 Tyne and Wear Archives ref: DX1388-1-93-James E Howe The Shields Daily News for 19 September 1906 reports: "At North Shields Police Court today, William Nichols and James E. Howe, boys, were summoned for having stolen from a house in Grey's Yard, Bird Street, on the 13th inst. 4d, the monies of Philip Thomasela, ice cream vendor. Prosecutor, through an interpreter, stated that he had missed money from his house and suspecting the accused who came to his place he marked eight pennies, putting four in his pocket and the remainder on a shelf. In the afternoon of the date named they came to his house. Howe asked him if he wanted any milk and he replied "Not today". They remained about the place and subsequently he missed the fourpence. He accused them of having stolen it. Nichol said he had sixpence, but he bought a packet of tabs getting 5d in change. He made him produce the coppers and he found the four marked coins. He sent for the police but they left before the officers arrived. John Guthery, an engraver, who lives opposite the prosecutor, said that from what he was told he kept observation upon the prosecutor's house and saw the two prisoners enter. He afterwards saw the prosecutor examine certain coppers which the prisoner Nichol had produced and heard him say that they were marked and that they were his. Sergt. Hall said he arrested and charged the prisoners. Nichol replied "We took it and Howe got half" and Howe replied "I got a penny". Prisoners were further charged with having stolen 5s from the same house on the 6th inst. This charge was denied. This was Nichol's first appearance, but Howe had been three times previously before the court, the last time in 1904 when he was charged with stealing 5s from the person, his father being bound over for twelve months. The magistrates remanded Nichol until tomorrow with a view to his father being bound over and committed Howe to prison for 14 days in the second division." These images are a selection from an album of photographs of prisoners brought before the North Shields Police Court between 1902 and 1916 in the collection of Tyne & Wear Archives (TWA ref DX1388/1). This set contains mugshots of boys and girls under the age of 21. This reflects the fact that until 1970 that was the legal age of majority in the UK. (Copyright) We're happy for you to share this digital image within the spirit of The Commons. Please cite 'Tyne & Wear Archives & Museums' when reusing. Certain restrictions on high quality reproductions and commercial use of the original physical version apply though; if you're unsure please email archives@twmuseums.org.uk. Name: Andrea Laudano Arrested for: Larceny Arrested at: North Shields Police Station Arrested on: 21st July 1904 Tyne and Wear Archives ref: DX1388-1-63-Andrea Laudano The Shields Daily Gazette for 8 August 1904 reports: "At North Shields, Andrea Laudino, Italian ice cream vendor, was charged with stealing a pony, value �8, the property of Bernardo Bianci, between the 13th and 19th of July. Prosecutor said that he was an ice cream vendor, and on the night of the 18th ult. he fastened up his pony in a stable in Upper Camden Street. Next morning he found that the stable and hay loft doors had been broken down, and the pony taken away. He had dismissed the prisoner from his employ five weeks previously. Chas. Campbell, Ponteland, deposed to purchasing the pony from the prisoner for �2. The man told him that the ice cream trade was bad and he wanted to get out of the country. PC Lishman deposed to arresting the prisoner, who pleaded guilty, and Detective Thornton spoke to recovering the pony with the prisoner's assistance. Accused stated that the prosecutor owed him 35s, and he took repayment by selling the pony for �2. He was committed to take his trial at the Quarter Sessions". The Morpeth Herald and Reporter, 22 October 1904 reported from the Northumberland Quarter Sessions trials: "Andrea Laudeno (28) ice cream vendor, pleaded guilty to stealing a pony from Bernando Branchi at Tynemouth on July 19th - One month". Sadly this wasn't to be Laudano's last brush with the law. The Shields Daily News for 2 September 1905 reports: "Andrea Laudano (28), an Italian, was remanded for eight days on a charge of stealing from a house in Grey's Yard, Bird Street, on the 19th ult. a shirt and a pair of boots of the value of 7s 6d, the property of Phillip Tomaselli". These images are a selection from an album of photographs of prisoners brought before the North Shields Police Court between 1902 and 1916 in the collection of Tyne & Wear Archives (TWA ref DX1388/1). (Copyright) We're happy for you to share this digital image within the spirit of The Commons. Please cite 'Tyne & Wear Archives & Museums' when reusing. Certain restrictions on high quality reproductions and commercial use of the original physical version apply though; if you're unsure please email archives@twmuseums.org.uk.